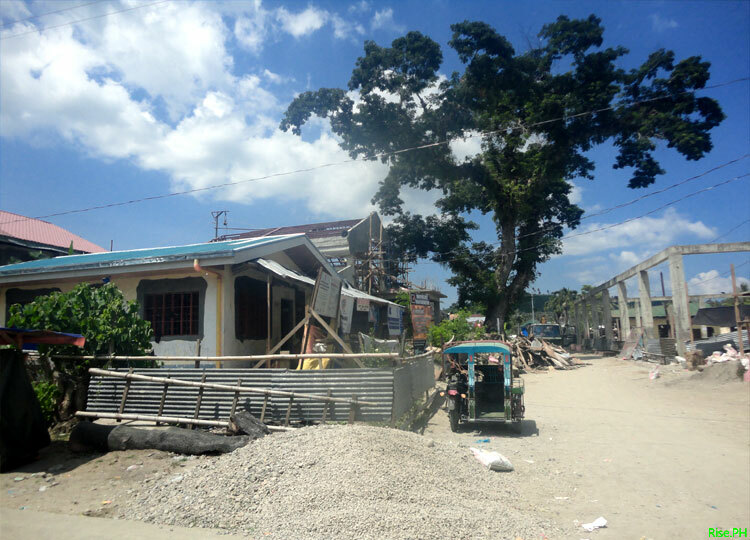 Nine months after Super Typhoon Haiyan (Yolanda) devastated the central part of the Philippines, there are already changes that we can see. I went to Basey Samar, Tacloban City and Palo Leyte on August 9 and 10 to take pictures and update the Filipinos and the world nine months after Haiyan struck us on November 8 last year. 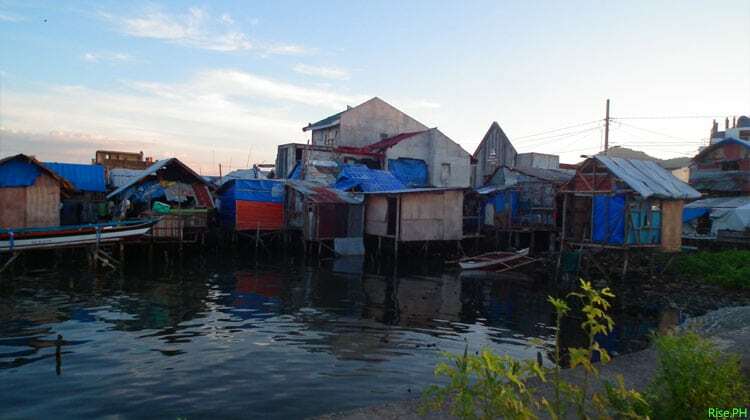 After nine months, I have observed and realized the following while I was touring the areas affected by Haiyan and having conversations with the survivors. 1. I saw big trees and plants already blooming within the areas that were directly hit by the typhoon (see photos below). I realized that our Mother Nature is more efficient than our government when it comes to rehabilitation and recovery efforts. Mother Nature is indeed destructive when she’s angry. However, when she gives care, it’s truly smooth and wonderful. 2. 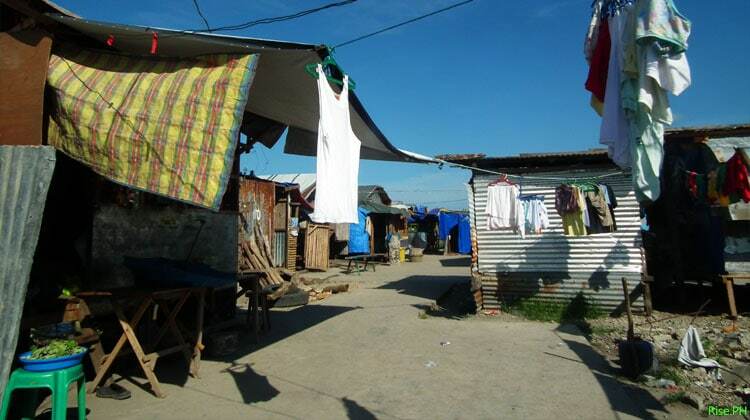 Recovery and improvements among Yolanda survivors aren’t the same. 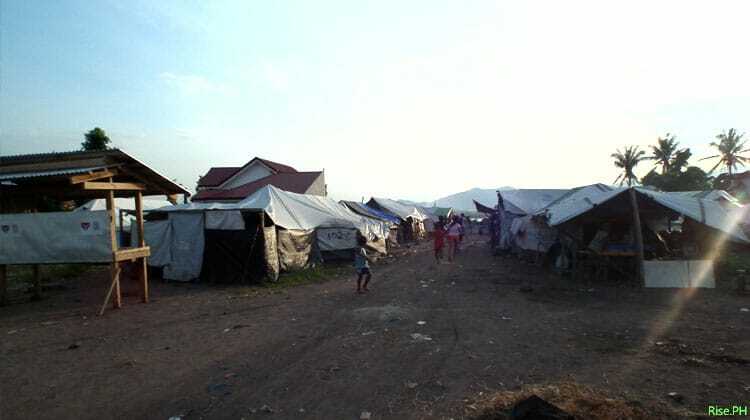 Some survivors were already back on their feet and having normal lives while others are still suffering (living) in tents and doing everything to survive each day. 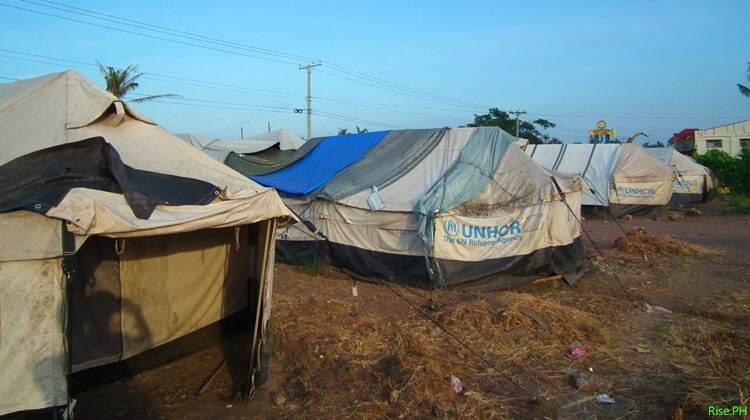 Their tents are only shelter against the sun, but not against the wind, heavy rains and flood. 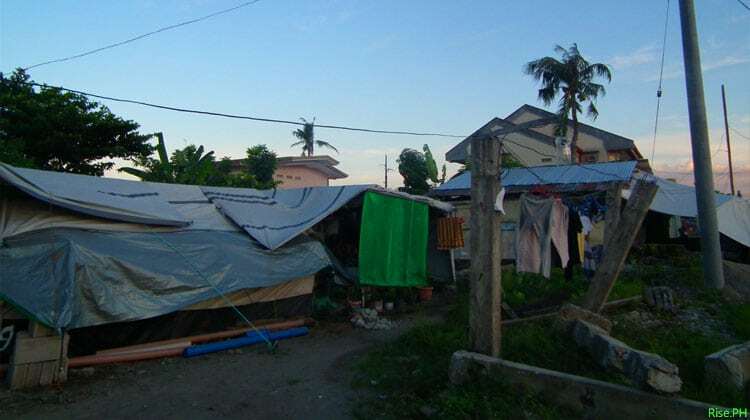 According to this report by Rappler, there are still 14,500 Yolanda survivors still living in tents as of July 30. 3. Political parties (divisions) are causing the distribution of aid and relief to survivors uneven. You are lucky if the politician who’s in-charge of the distribution is your political ally. If not, then expect that you will get less support from the government. 4. 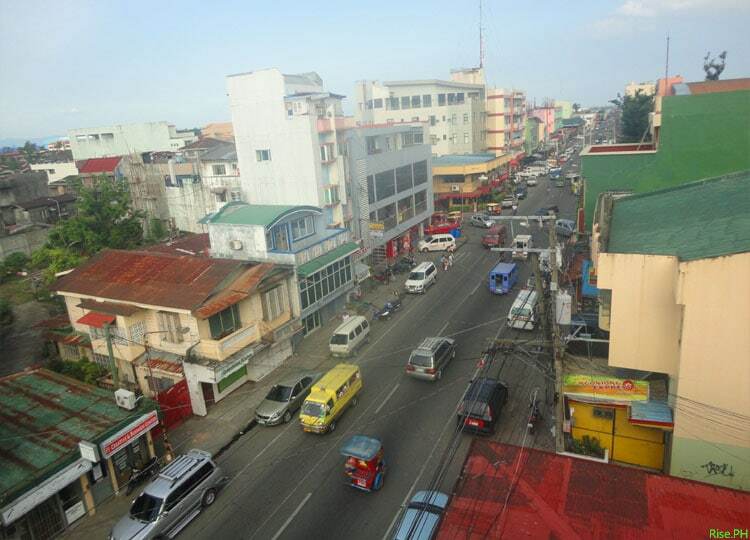 Tacloban City, the most urbanized city in Eastern Visayas, is already showing progress. Private and government establishments, such as malls, department stores, hotels, restaurants, resorts, schools, and government offices are already open for business. However, there are still a number of business establishments that are still ruined and bankrupt due to the looting incident. They still need support from the government to get back on their normal business. 5. Indeed Filipinos are very resilient. After nine months, you can already see them trying to live a happy life, whether they are living in new houses, bunkhouses or tents. One of the things that causes this resilience is unity within the community. 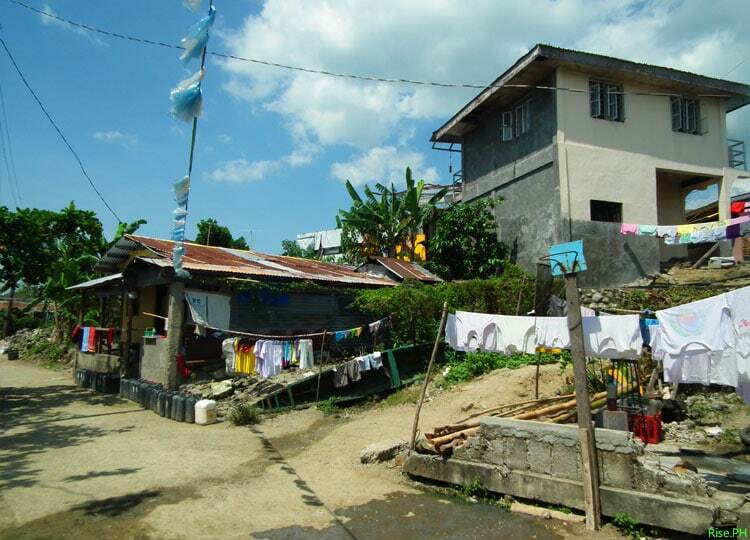 Filipinos love to spend time talking with their neighbors. The children enjoy playing with other kids in the neighborhood. This strong ties among the Filipinos keep us strong and persistent no matter what challenges come upon us. There are many other specific things that you can know and understand in this post. 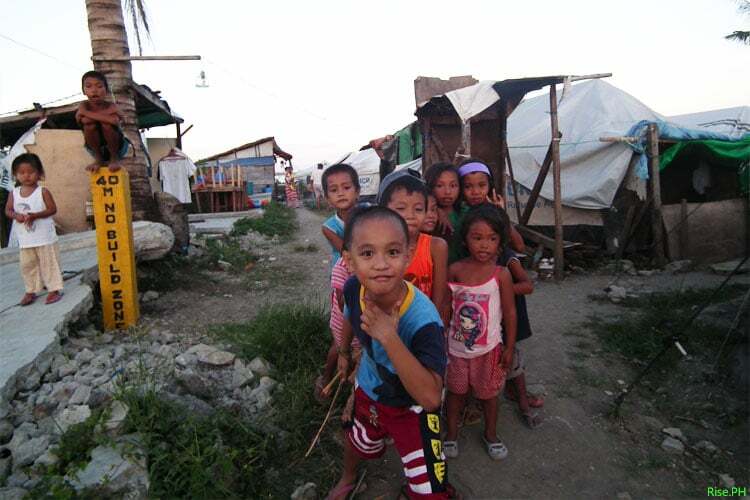 Check out these photos to get some updates about the lives of survivors nine months after Yolanda caused destruction in Eastern Visayas and other parts of the Philippines. From San Antonio Basey Samar, we’ve just arrived in Tacloban City. 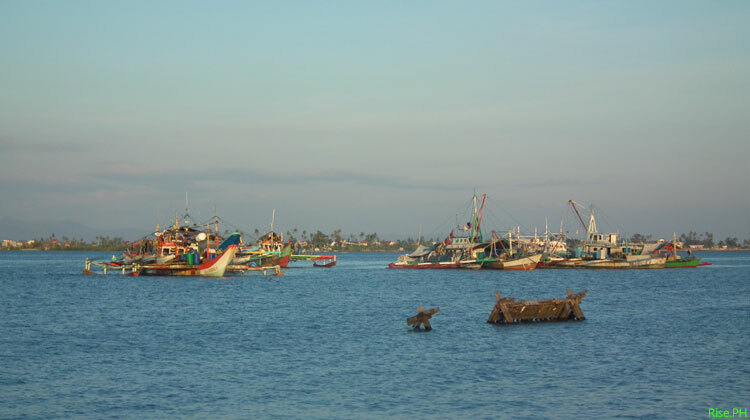 Passenger motor boats from San Antonio to Tacloban and vice versa are already operating. The travel takes only about 15 minutes and the regular fare is P12. Check out the last photo to see the port at San Antonio where we came from. The sea is calm. 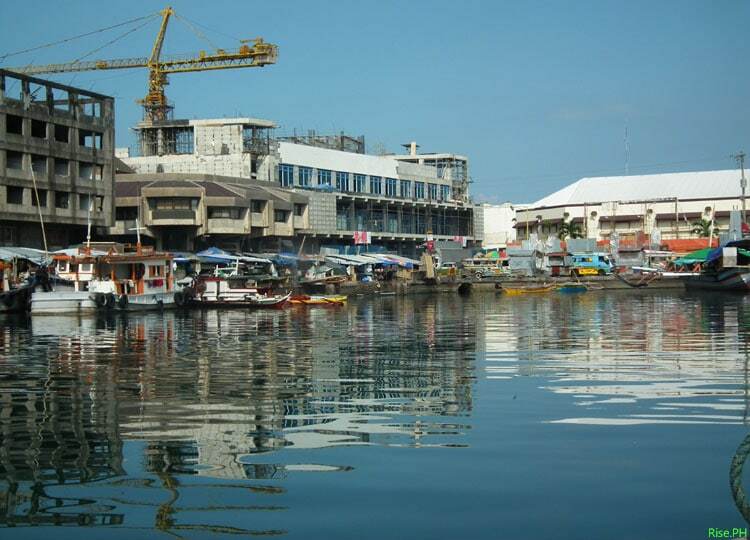 From the boat, you can see Gaisano Capital (right) which is still closed and the ongoing construction of SM Save More (left). While Gaisano Capital is still closed, Gaisano Cental is already back on business since June this year. 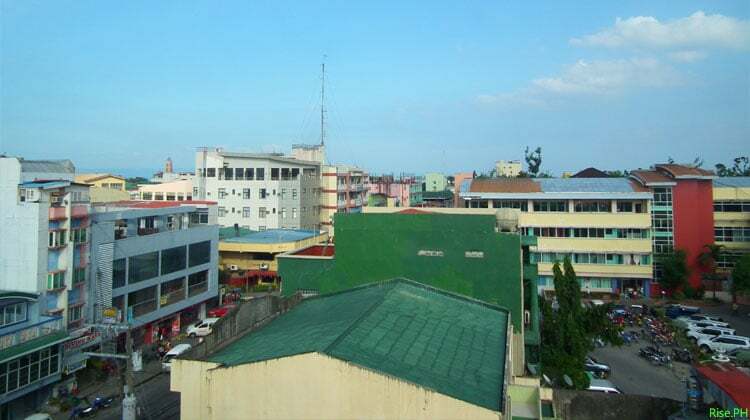 Tacloban Downtown view from the roof top of a building in Avenida Veteranos street. The busy street of Avenida Veteranos. You will find here restaurants, hotels, and St. Paul’s Hospital. 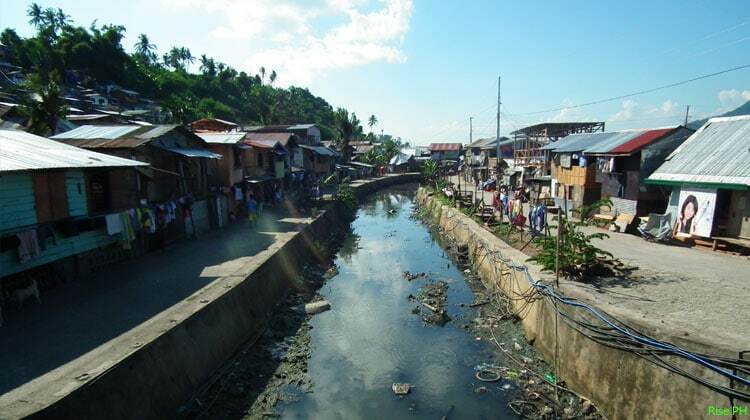 This creek in Sabang Anibong was full of debris during the typhoon. But now it looks like it’s already clear. 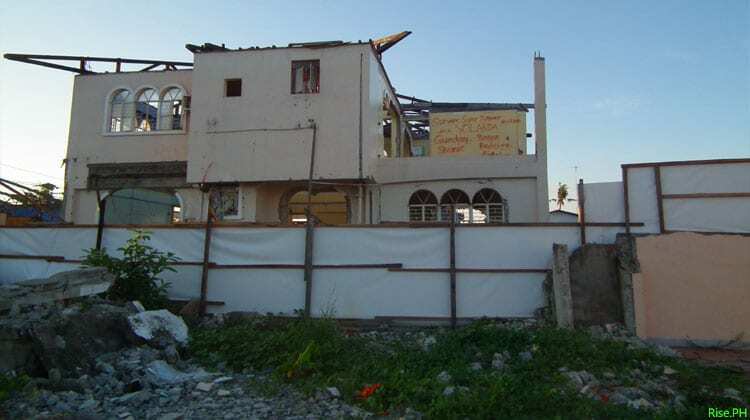 However, the government has already implemented the “40 Meter No Build Zone” which require the residents to leave their lots here and be relocated to safer areas. 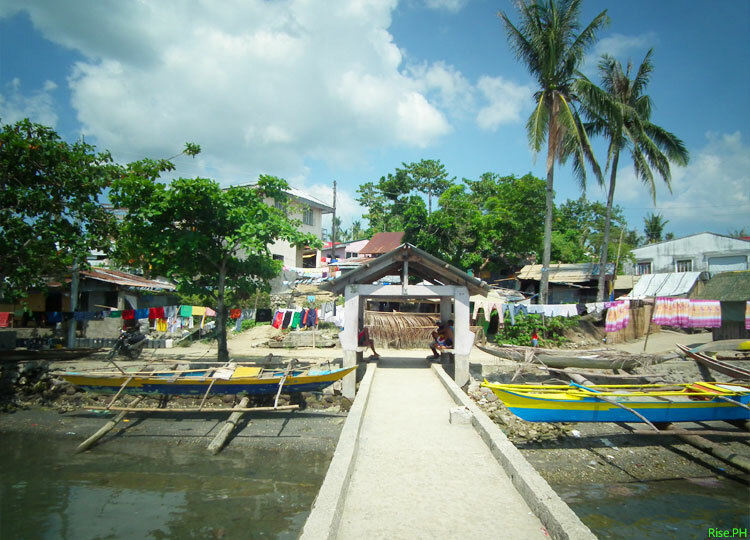 The other side of the creek in Sabang. 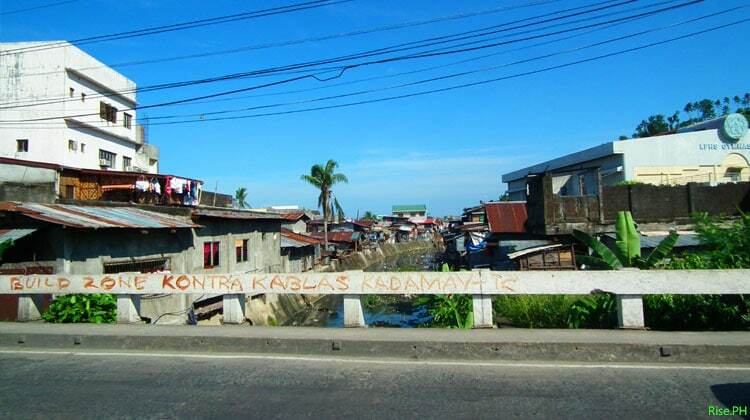 A group named “Kadamay” wrote “No Build Zone Kontra Kablas”. Kontra kablas means “Anti Poor”. Yes, you’re seeing it right. 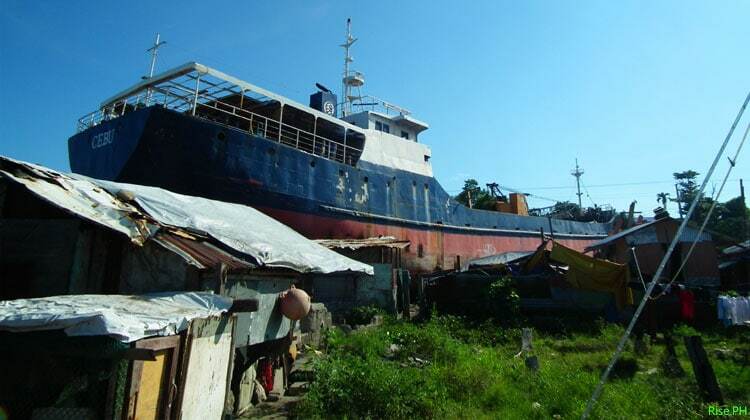 After nine months, the ship that was washed ashore at Barangay Anibong Tacloban City is still there. A banana tree has already grown and that tree on the right side has already bloomed, but the agency or company responsible for this has not yet started to scrap and remove that ship! It has been moved but has not been removed. 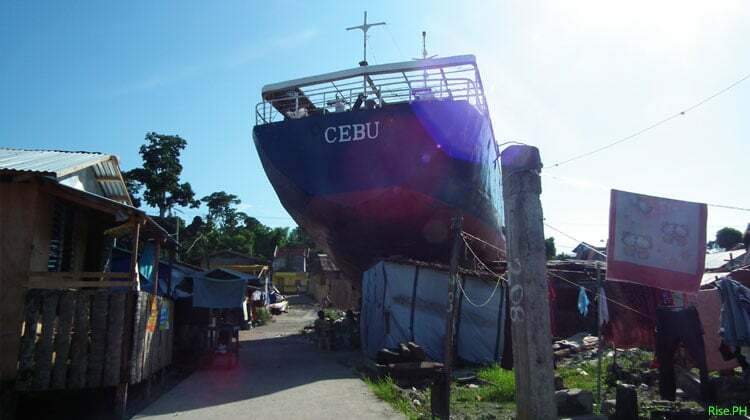 (Update: According to a resident in that area, the owner of the ship has already applied for a permit to scrap/salvage the ship but the approval of such permit is still pending at the city government). If you’re thinking that it’s good to remain it there to serve like a memorabilia, you’re thinking it wrong (Okay, it’s just my personal opinion). 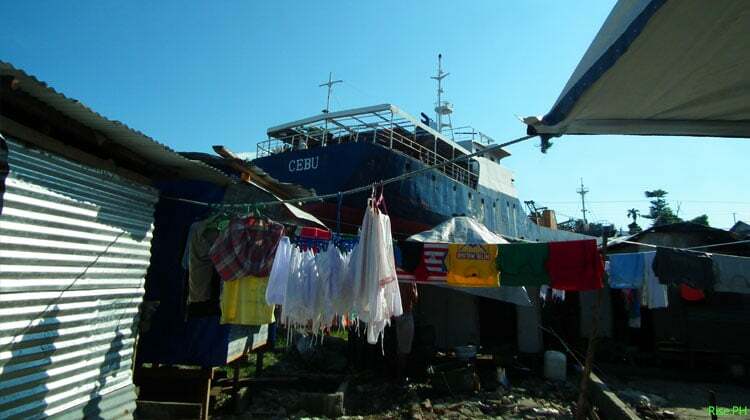 Actually, the residents want to remove this ship as soon as possible, fearing that a typhoon or storm surge will come again to wash this ship and ravage houses and lives of people. Should it be scrapped and be broken into pieces to remove it there? 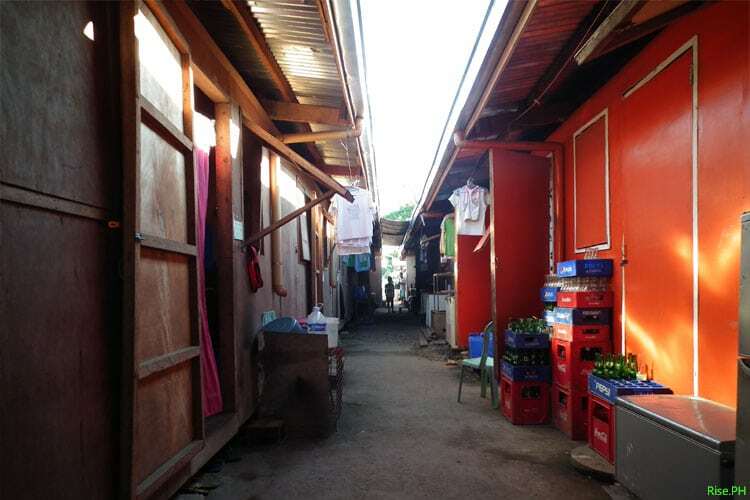 … or should the residents be relocated and be granted permanent houses in a safer location and let the ship remain? What do you think? If you’ll ask me, I think a ship docking in a wrong place is a dangerous thing. The back view of the ship. Residents here have already built temporary shelters. They live along with the ship – a ship that destroyed their houses and claimed the lives of their loved ones. 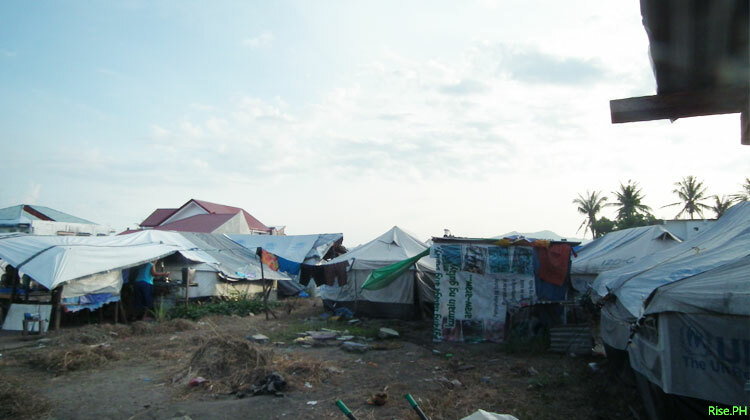 Several families are still living in temporary houses in Anibong. They should be relocated in a safer area. 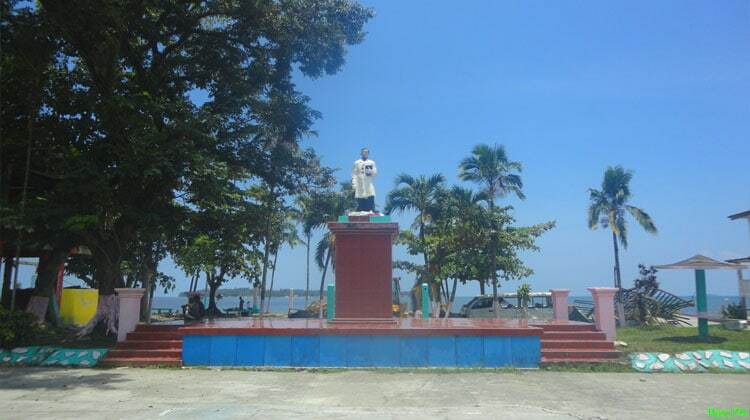 Just like Anibong, Old Road Sagkahan is one of the areas in Tacloban located in the shoreline. Houses are washed out here and many people have died in this area. 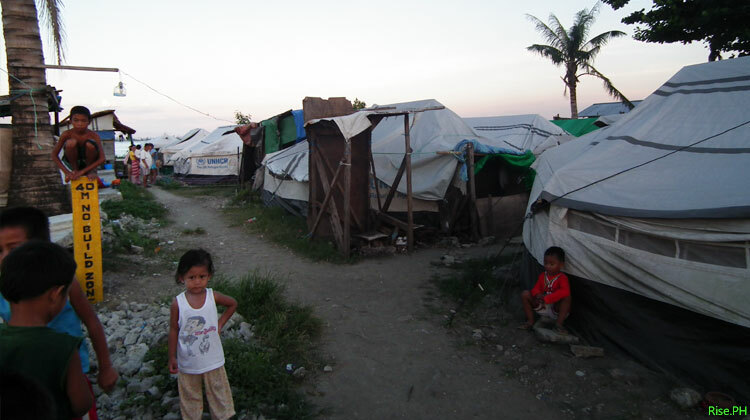 Nine months after Haiyan, many families are still living in tents and temporary shelters. A boy sitting on the top of a post built by the government to mark the 40 meter No Build Zone Policy. 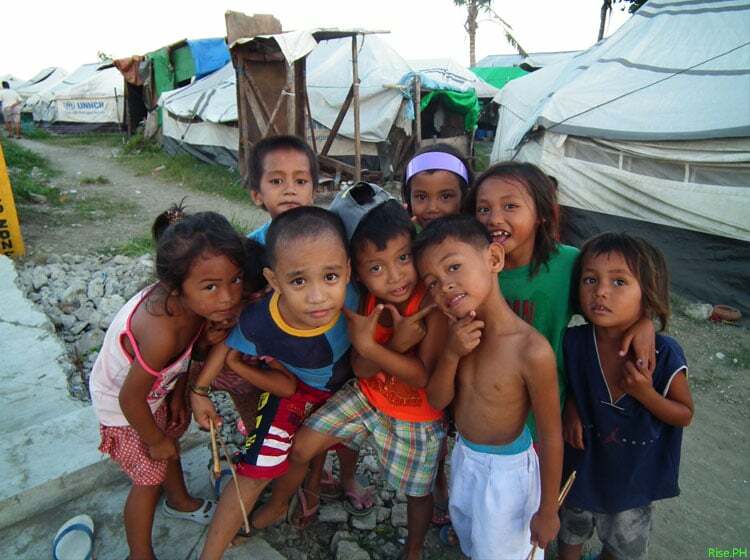 Despite of all the tragedies, these children are still showing their jolliness. It’s Sunday and they are playing. 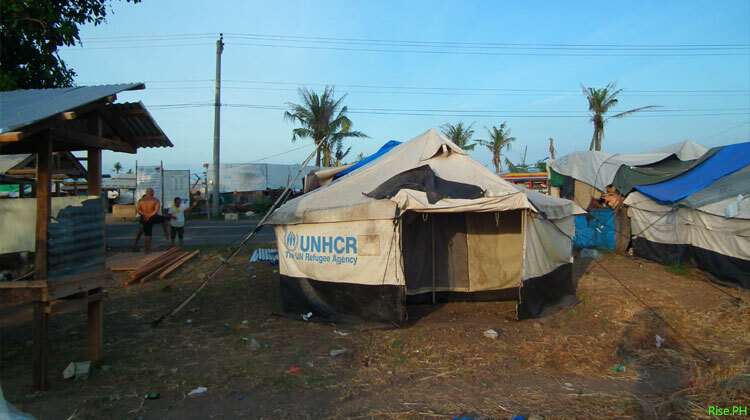 You can see these tents along Old Road Sagkahan, Tacloban City. 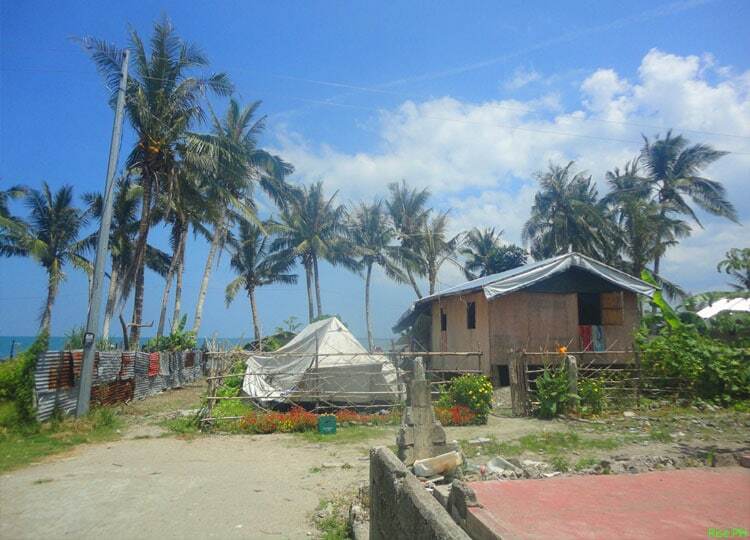 Residents of Sagkahan have already built these temporary houses along the shore despite of the government’s No Build Zone Policy. During heavy rains and bad weather, they evacuate to Tacloban Astrodome (see following pictures). 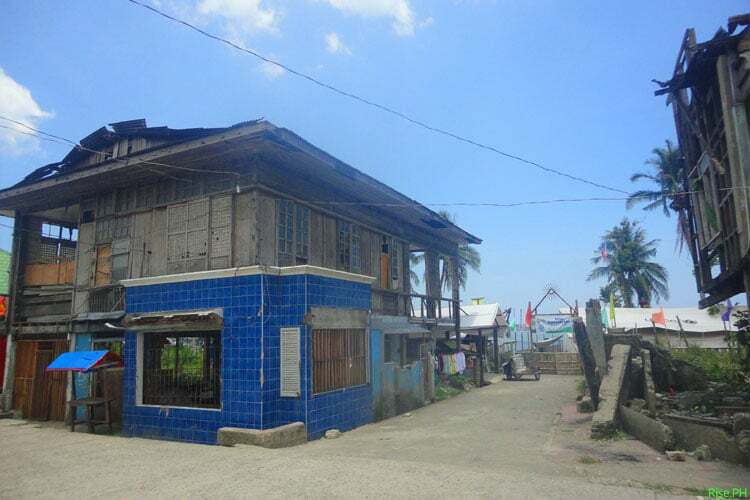 A house in Old Road Sagkahan that was destroyed by Typhoon Yolanda. 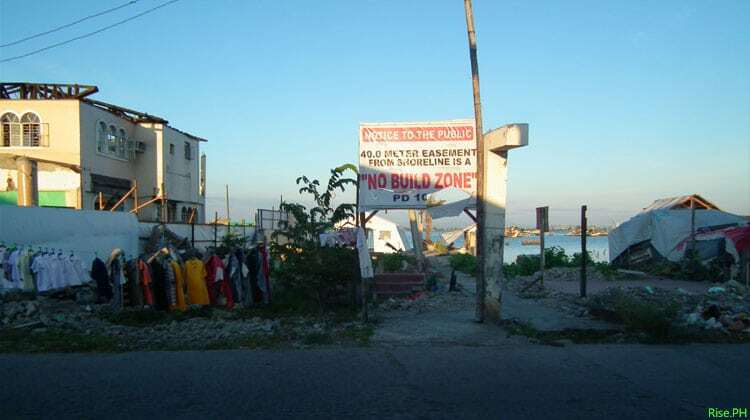 A signage / notice to the public on government’s 40 meter No Build Zone decree. 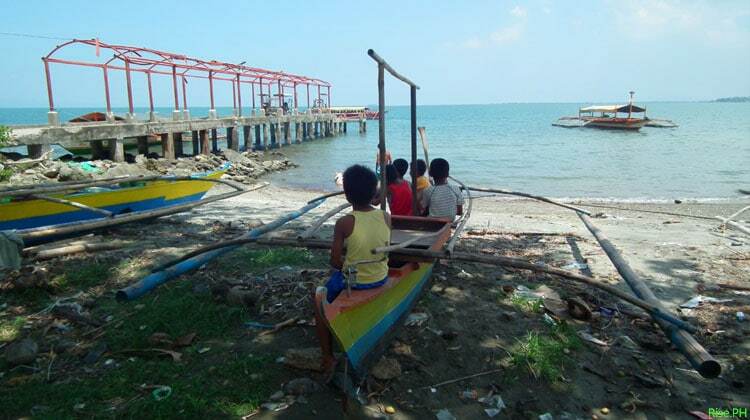 Fishing boats are already operating in Sagkahan. 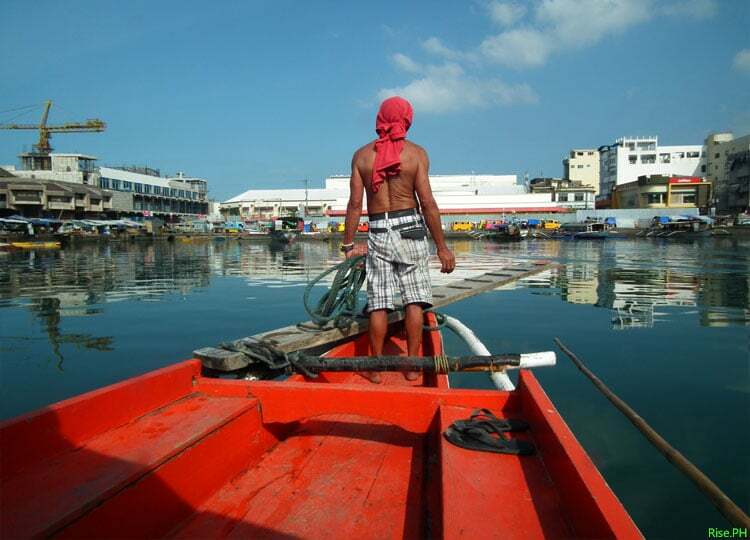 They regularly deliver fish at Shed – a popular wet market located in Old Road Sagkahan, Tacloban. 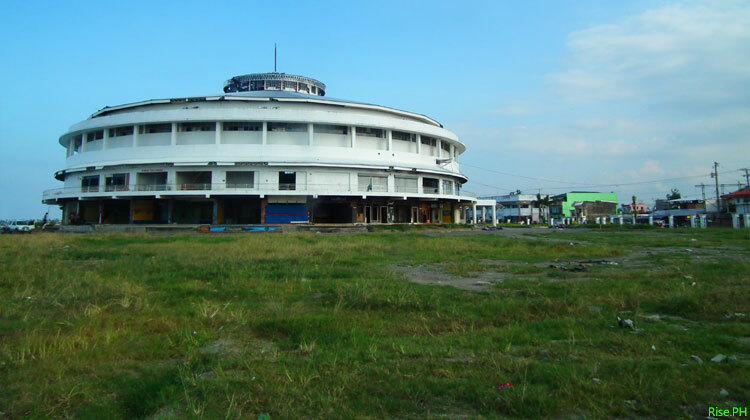 Tacloban Astrodome as of August 9, 2014. The businesses (bars, restaurants, gym, offices) that were originally here have not yet reopened. 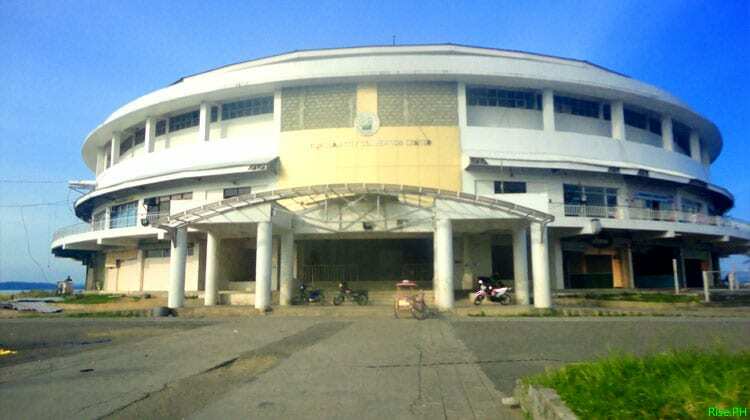 The front view of Tacloban Astrodome. 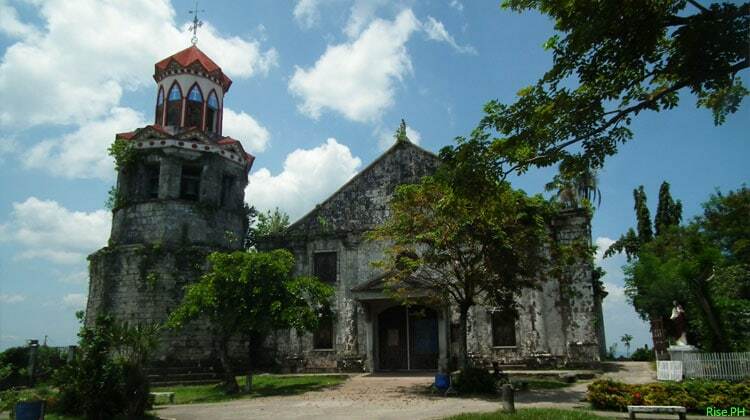 This structure served as an evacuation center during Haiyan. It’s still serving as an evacuation center for families who are still living in tents and temporary houses during days with bad weather. 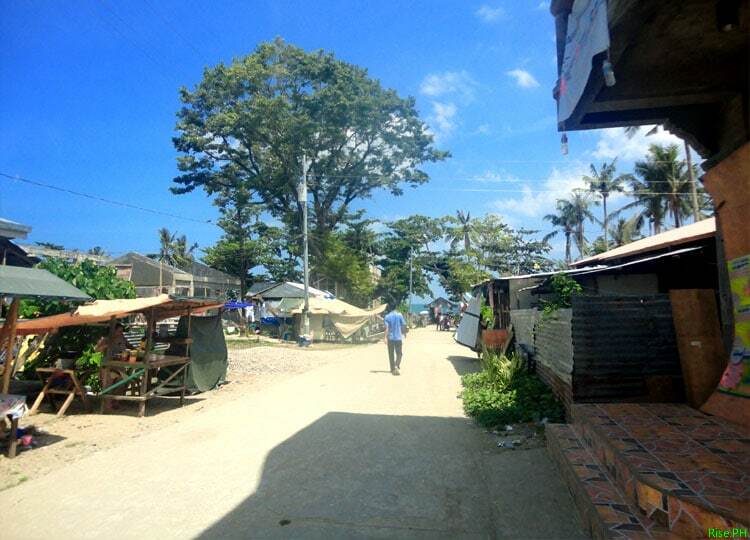 This is my first time to visit San Jose after Haiyan, and I can hardly recognize the place. Several families are still living in tents. 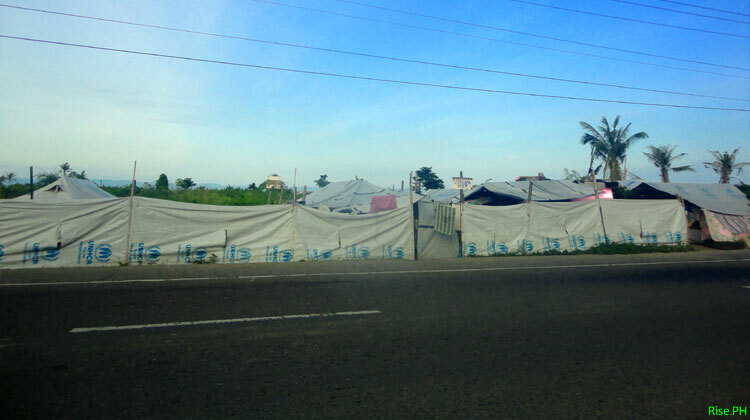 If you’re going to Tacloban Airport, you will see these tent cities. That’s how locals call this place. 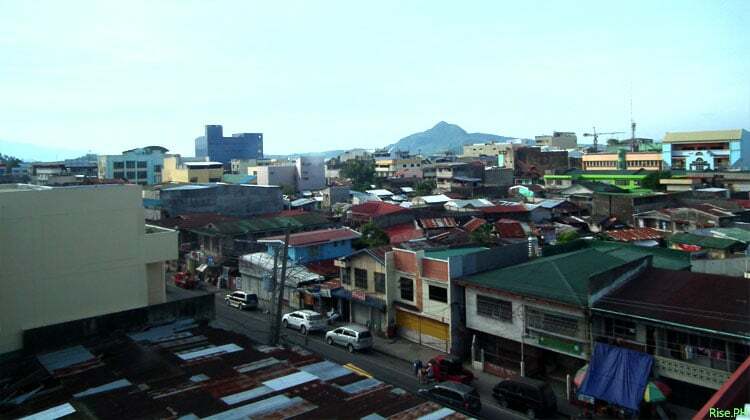 San Jose is probably the place where most people died during the typhoon and storm surge. I can’t imagine how they keep their daily living here for nine months now. 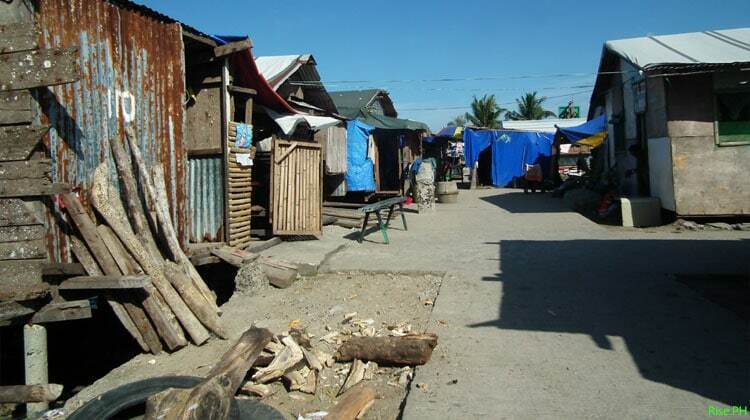 A resort and restaurant is located near the tent cities in San Jose. 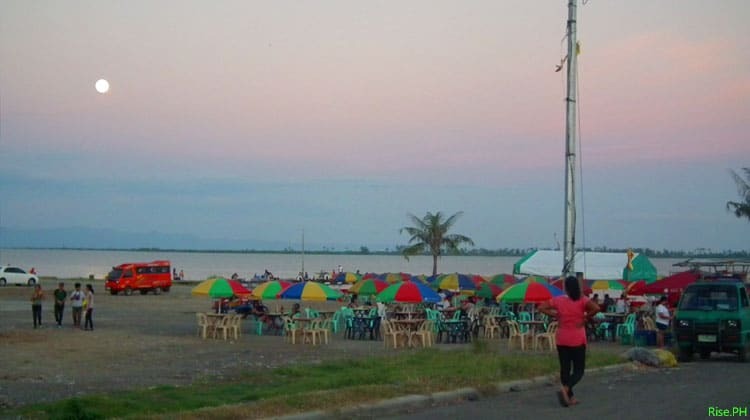 I can’t image how their customers can enjoy and relax at the resort while knowing that a few meter away, many Taclobanons are still suffering from hunger in the tent cities. When I asked the residents what the government is planning for them, they told me they don’t know. 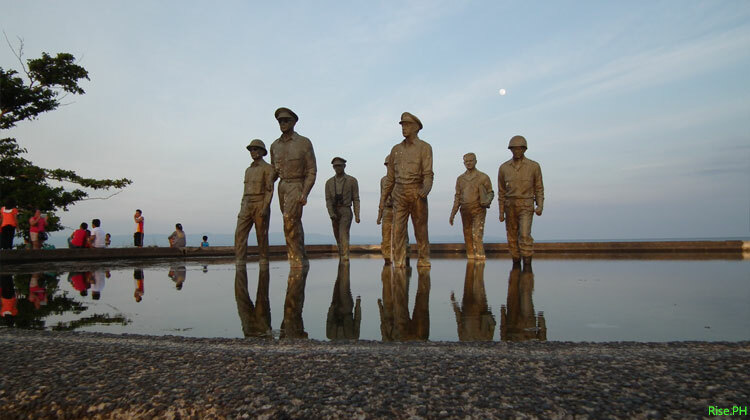 A show of hope, these monuments of General Douglas Mac Arthur and his men have stood again. Locals and visitors can unwind here. This place is also great if you love jogging and running. 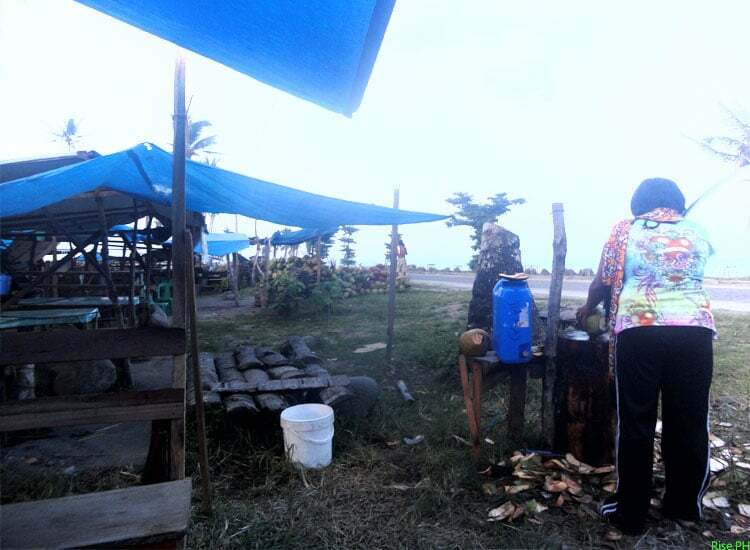 And after your jogging or unwinding, you can buy some fresh coconut or buko juice to replenish yourself. 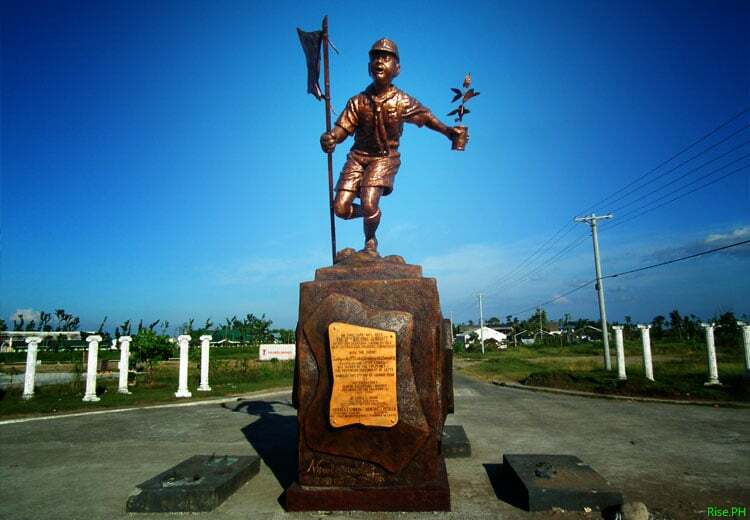 Do you know this monument of a boy scout? 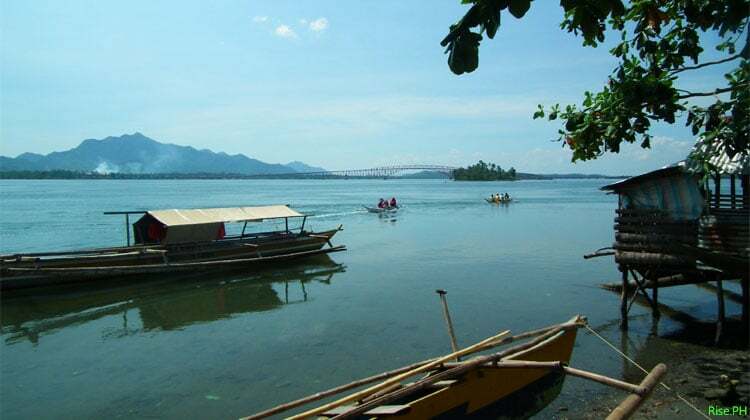 If you’re from Tacloban or Palo, you will certainly remember this. Yes, it’s still standing. 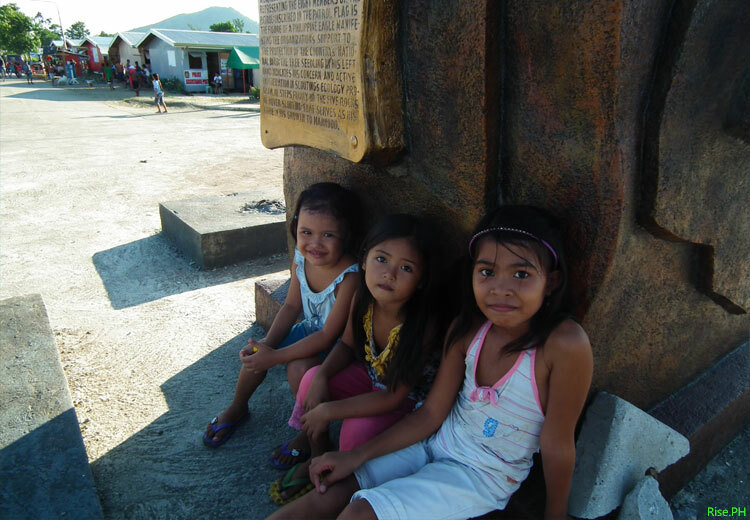 These lovely children living in the nearby bunkhouses want me to take some picture of them. 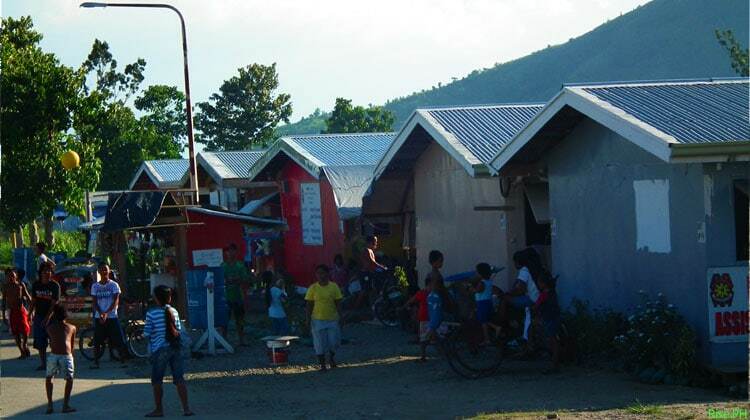 Residents of bunkhouses in Government Center Palo are doing their recreation on Sunday afternoon. They are also planting some vegetables to add to their food supply. 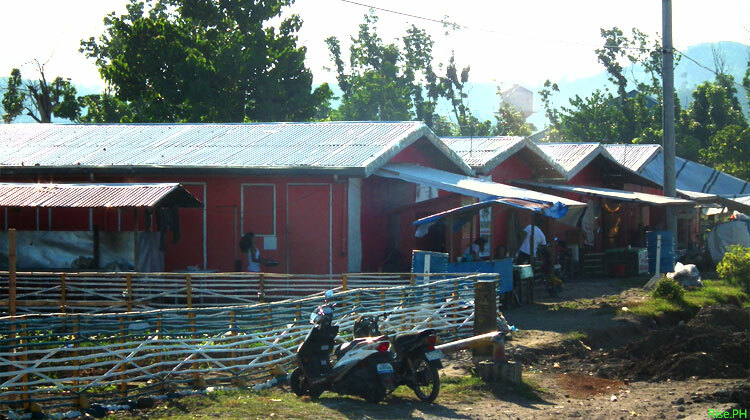 A closer look at the bunkhouses in Government Center, Palo, Leyte. 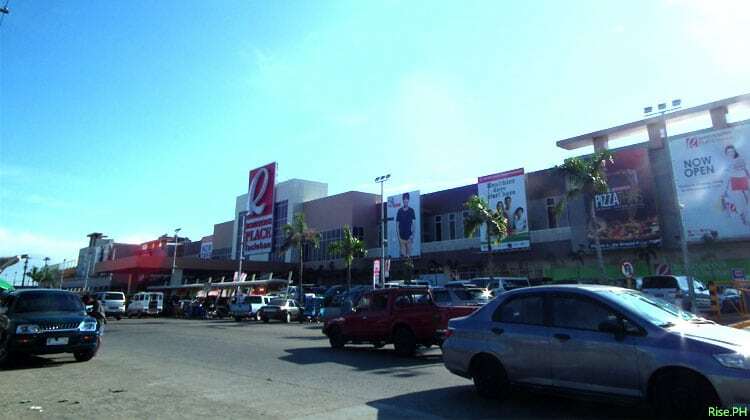 Robinsons Place in Marasbaras has already been fully operational since June 28, 2014. If you love shopping, dining and watching movies, this is the place to be at the moment. 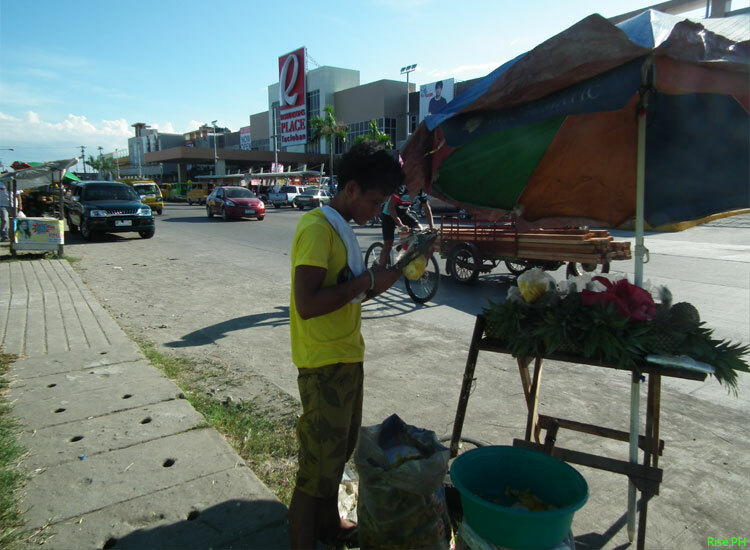 A pineapple vendor beside Robinsons Place. 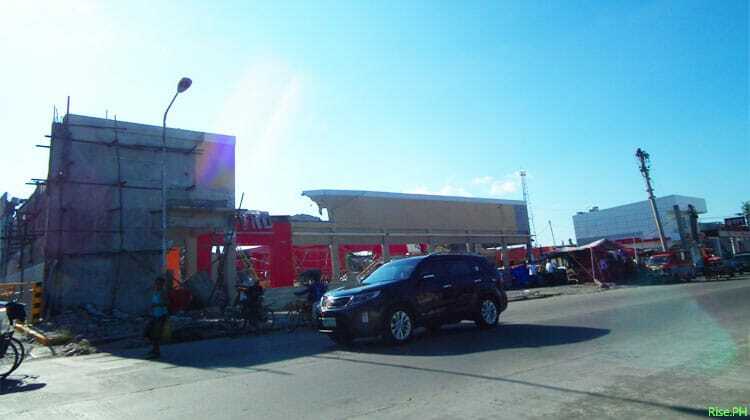 Beside Robinsons Place in Marasbaras, you can still see the ruins of Market Saver. 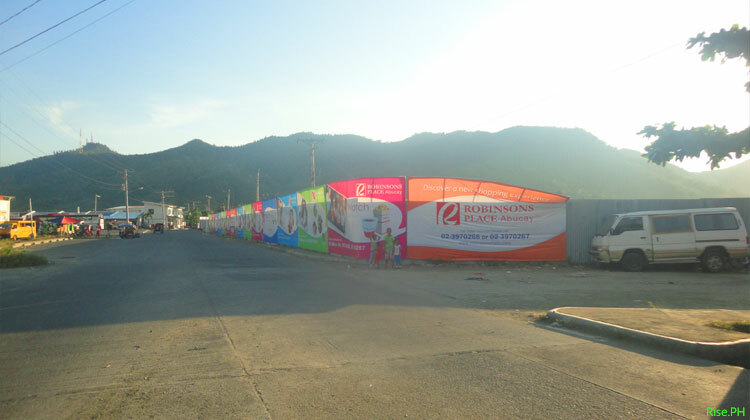 This is the future site of Robinsons Place Abucay, located within the New Tacloban Terminal. 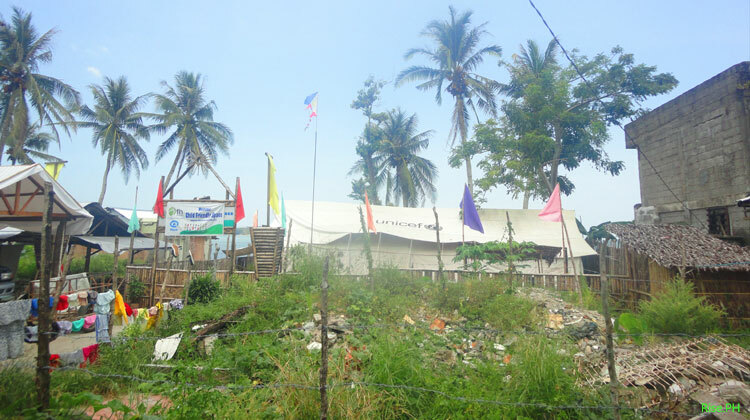 Days after Haiyan, this area served as the temporary dumping site in Tacloban. I’m glad that it’s clean now. 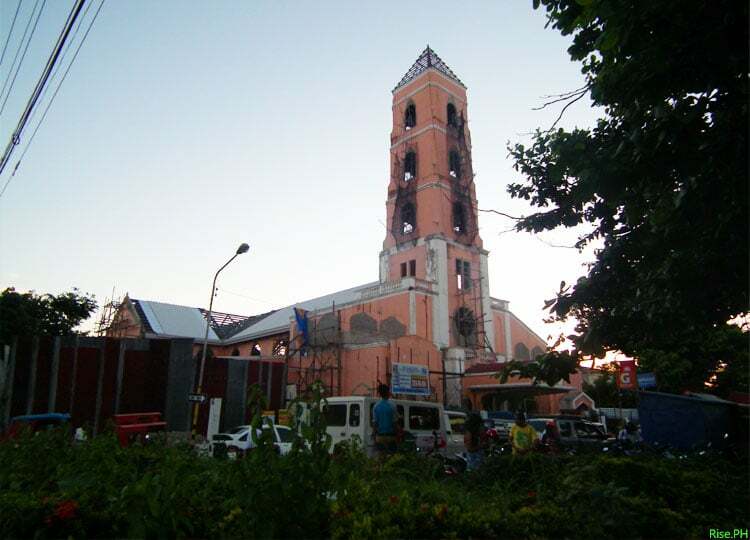 Santo Niño Church in Tacloban City is still going under repair and renovation after it was damaged by Haiyan. 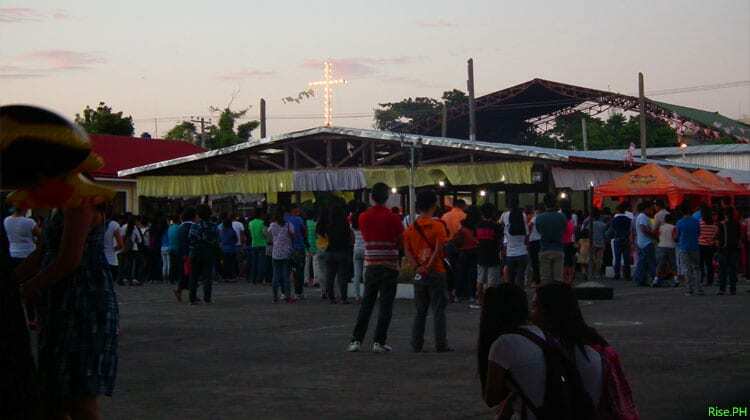 As the structure is still under construction, Sunday Catholic mass is temporarily held in this area in front of the church. At Balyuan Park or popularly called MAGS. 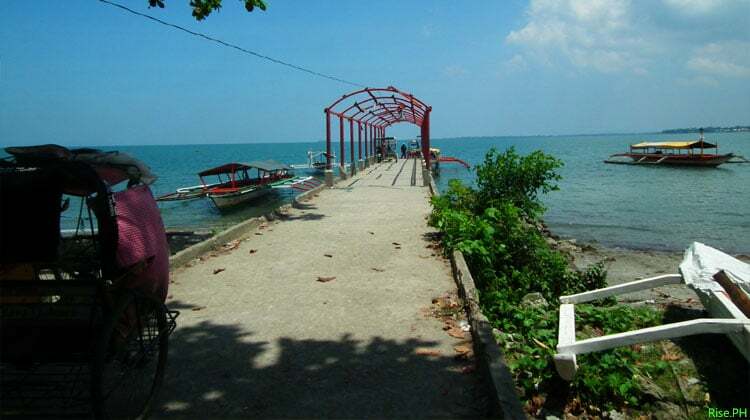 Here, Taclobanons and visitors can enjoy barbecue and the great view of the bay during afternoon and evening. 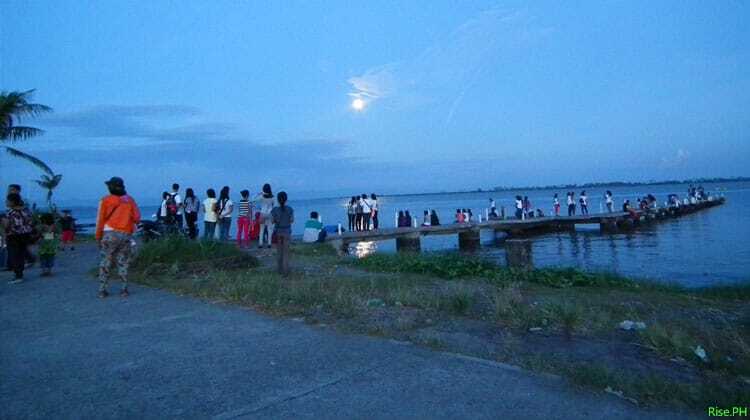 Many people flock at the Balyuan Park to witness the Super Moon on August 10, 2014. 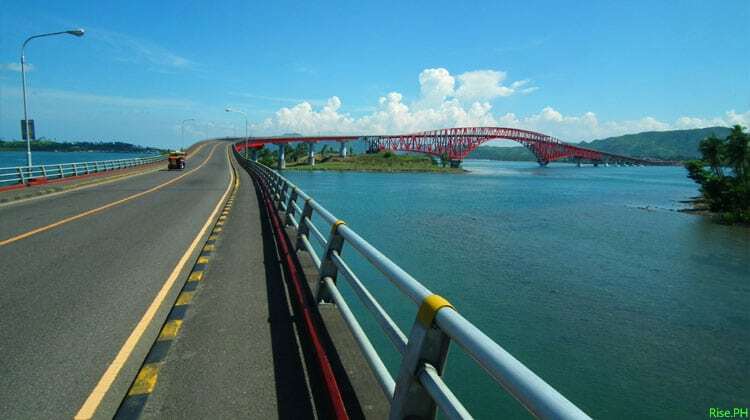 San Juanico Bridge is the longest bridge in the Philippines that connects Leyte and Samar. Children swimming below the bridge like there was no calamity that happened. 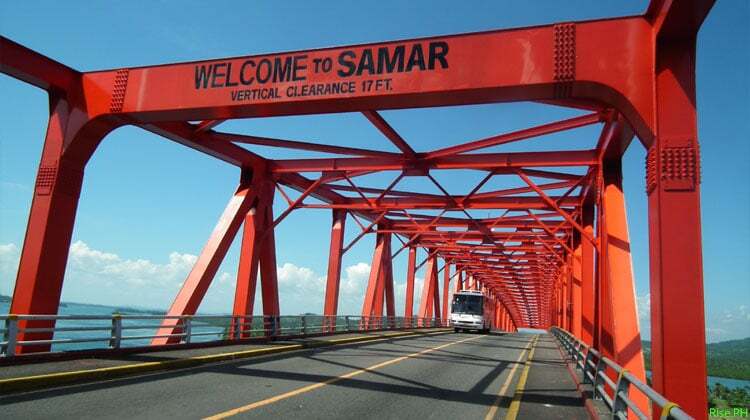 The structure was just newly painted by the DPWH. I don’t know the reason why. Is it to make it more beautiful? To make it withstand the weather? Protect it against rust and corrosion? Guess what? 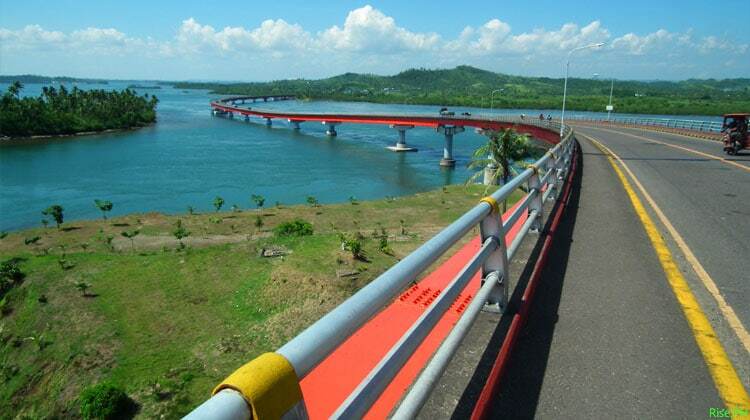 An amazing view of San Juanico Bridge. A more stunning view. 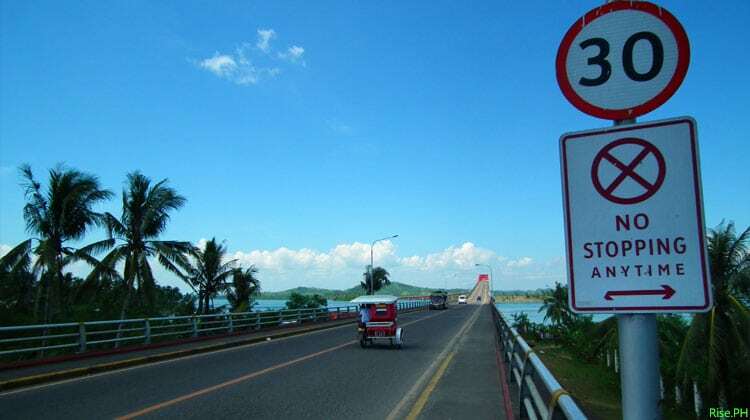 This bridge did not stop connecting Samar and Leyte even during and after Haiyan. Residents chitchatting at the waiting shed in Tinaogan. 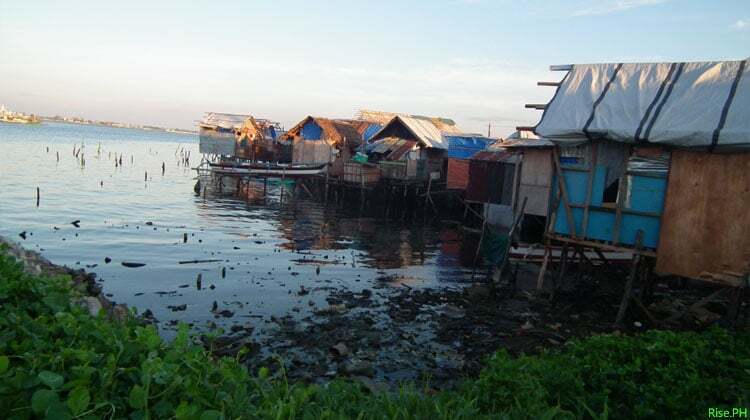 The residents of Tinaogan have already built houses near the sea as usual. 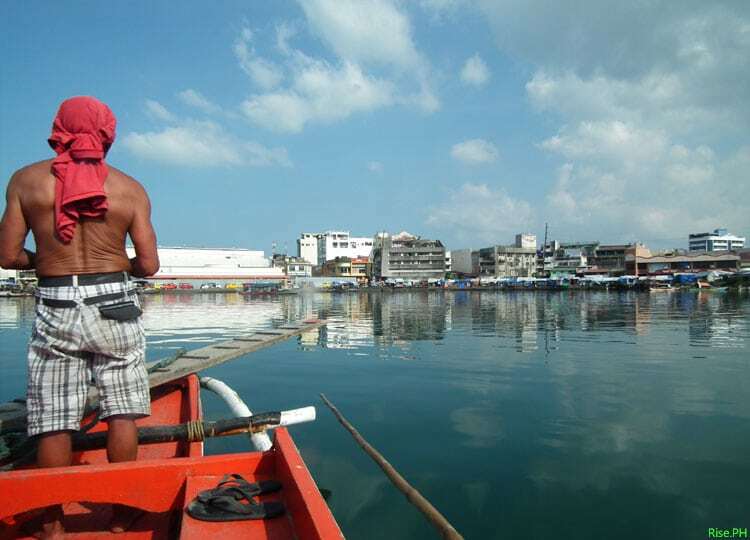 Fishing is still their primary source of livelihood. It’s a sunny day and a great day to wash and dry clothes. 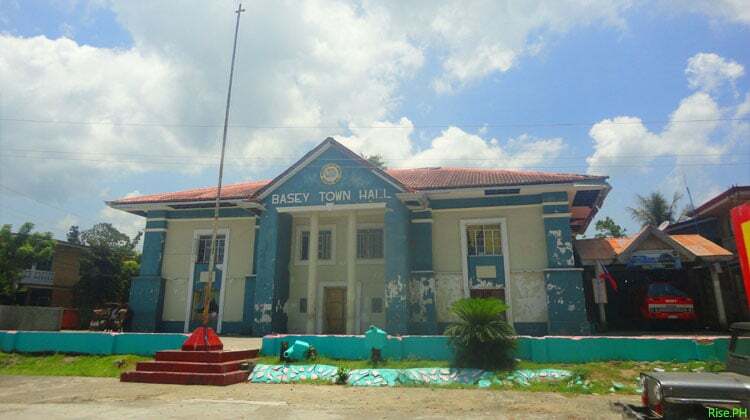 The Basey Town hall during Saturday. 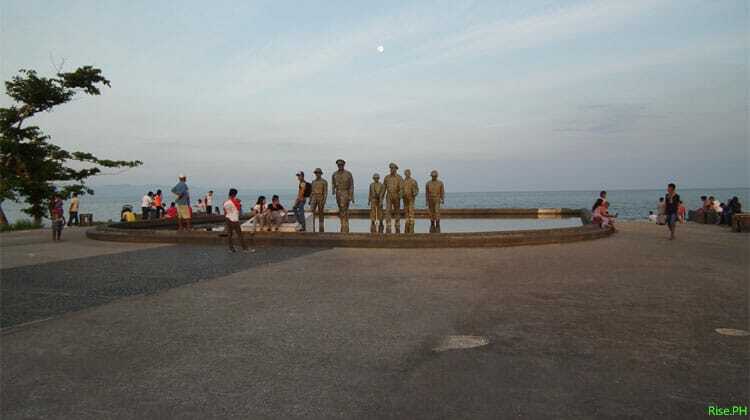 The monument of our National Hero Jose Rizal is still standing here. 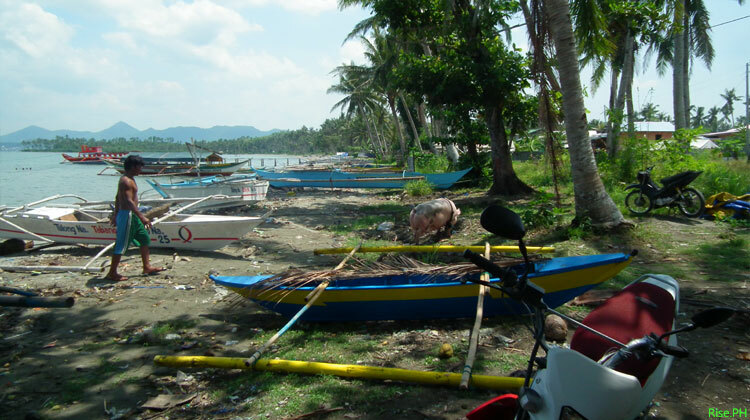 Basey Samar is also one of the areas that were directly hit by the storm surge that killed many people. 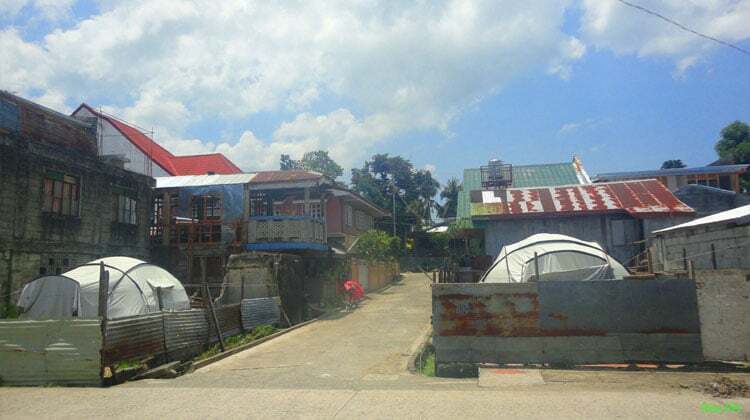 Houses in Basey that were damaged or destroyed by typhoon Yolanda. 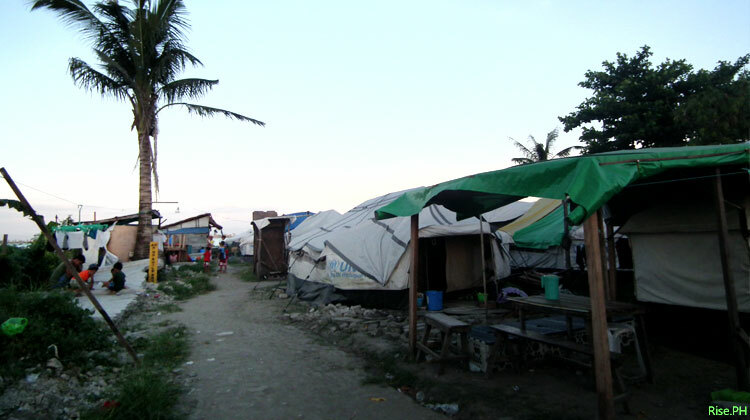 A temporary shelter in Basey Samar. 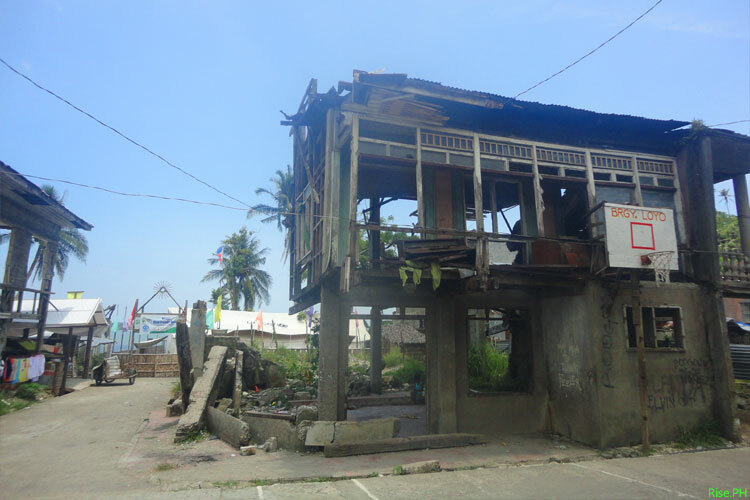 The destruction caused by Haiyan can still be seen in the town of Basey. The Catholic Church of Basey. 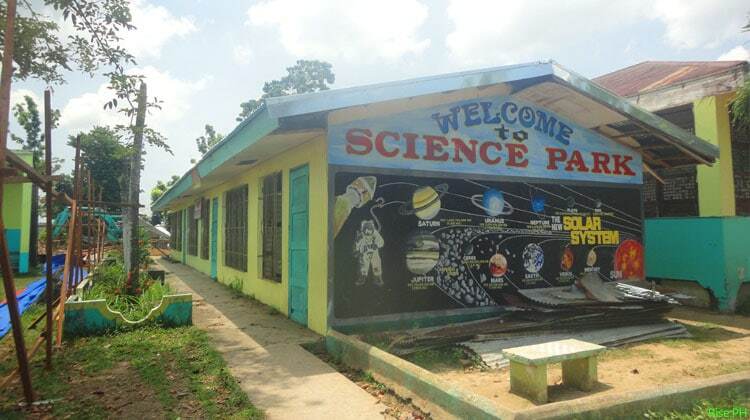 Classrooms in Basey Central Elementary School. 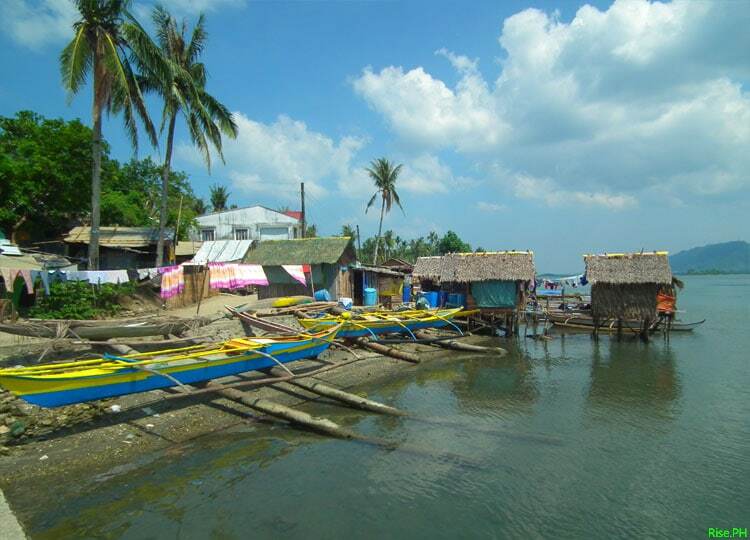 The barangay of San Antonio was badly damaged by the storm surge brought by Yolanda. Some news reported that the area was totally washed out during the surge. 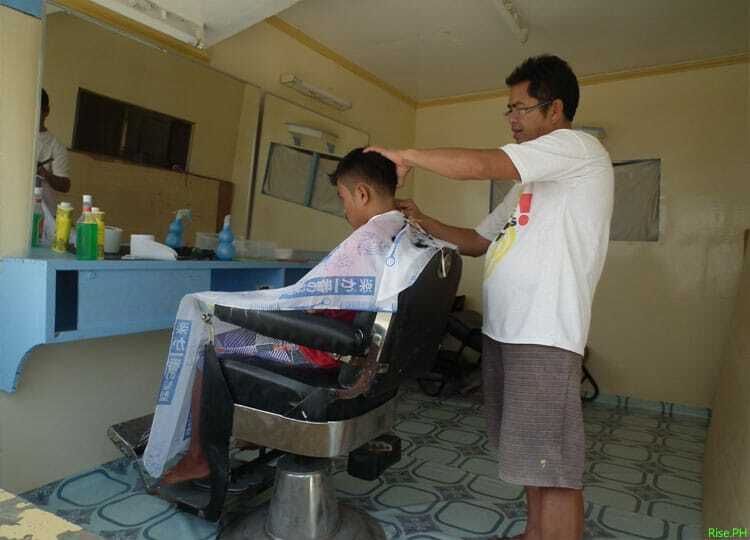 Manong Ronnie has started a barber shop in San Antonio and moving on despite of the destruction of their house and the loss of his loved ones. 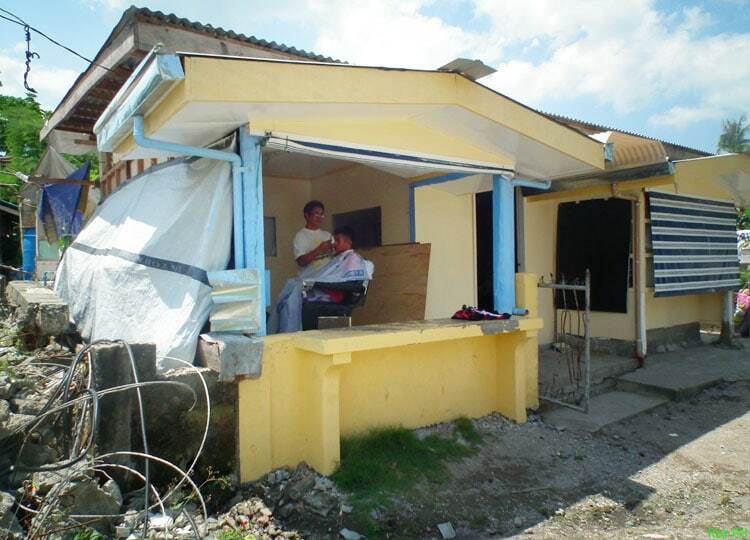 His house is still damaged but his barber shop looks as good as new. Manong Ronnie and his client. 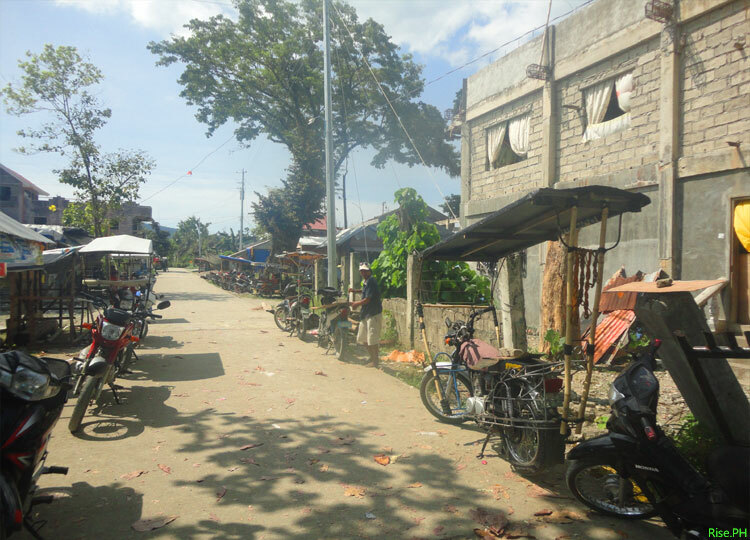 Trees and plants are already grown and green in Barangay San Antonio. I hope that the government is as fast as the nature when it comes to recovery and rehabilitation. Willy, parking his motorcycle. Habal-habal are the primary means of land transportation in the remote parts of Basey Town. Children sitting and chit-chatting on a boat in San Antonio. 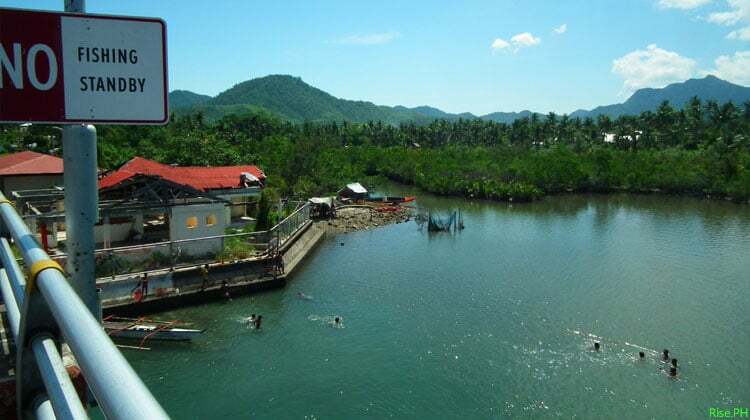 If you remember the first picture above where we were about to arrive at Tacloban, this is where we came from. Please share this post to let the world know the real situation of Haiyan survivors nine months after the typhoon struck us. ” but the agency or company responsible for this has not yet started to scrap and remove that ship! ” they did try to move the ship. 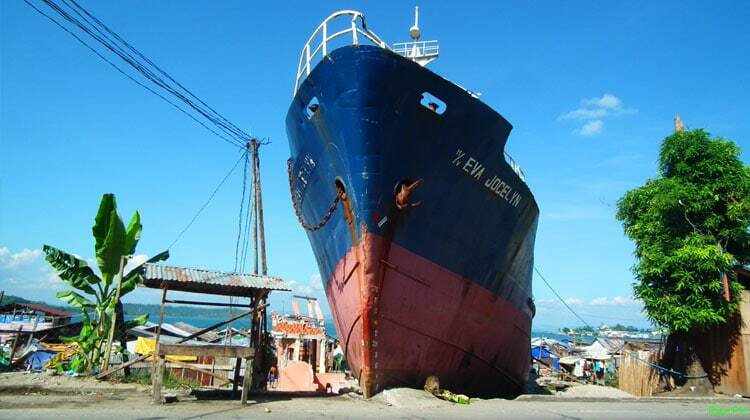 this was the original position of the ship right after the typhoon and it moved ergo they did try… pero may mga bahay na nakaharang papunta sa dagat e… so anu sisirain mo ulit yung bahay nila para makuha lang yung barko? the company has to pay pa sa mga may ari ng bahay if ipapasira pa nila para maibalik nila yung barko sa dagat… unless mabuhat nila yung barko papunta sa dagat para di ma.anu yung mga bahay dun. Hi Ryan. Thank you for sharing those information and for clearing some issue. May I ask a question. Which is better, to remove the ship with the control of humans or let a storm (storm surge) move this ship again and smash the houses and people near it? Thank you. I feel you. We share the same sentiment. yan na barko na yan apat na pamilya ka ofis mate ng asawa ko ang namatay dalawa ang missing,kaya dapat ni lang tanggalin na yan, yun mga nakatira nalang diyan ang erelocatesa magandang lugar,about sa support ng government until now wla parin washout din yon bahay namin a sanjose tacloban dahil sa kaasa sa wala umalis nalang kami sa tacloban punta sa ibang lugar para makapagsimula uli. 9monhts na pala makalipas bayuhin kami ng bagyong yolanda,9months na pala kaming pinapaasa ng gobyerno na may tulong na darating samin,9m0nths na rin kaming umaasa na isang araw may kakatok samin mga sira sirang bahay at sasabihin samin na ito na ang matagal nyu nang hinihintay ang mga pangako ng goyerno na may financial assestance na galing sa bulok nilang pamamalakad sa gobyerno,ok lang naman samin kung wala talaga sanay naman kami sa hirap pinoy kasi kami sanay sa pag papahirap ng bulok na sistima ng gobyerno,ang amin lang wagna kayong magpaasa kung di rin lang matutpad! 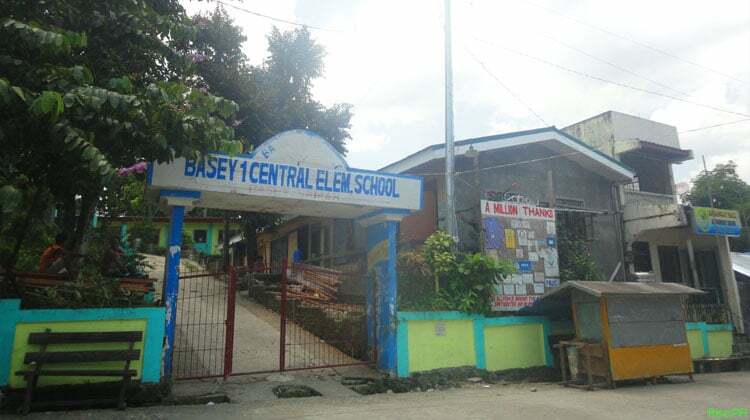 The LGU of Basey did not tell the REAL number of casualties. nice updates here. 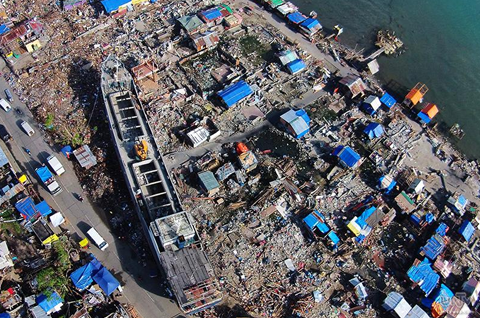 for us who have not been to these areas since #Haiyan, your article is a sign of hope. but it is still sad to note that our government has done so little after the world has helped us so much.